Allow me to paint you a picture. There you are after a long day of work (whether you’re working or avoiding work, the point remains). You are laying in bed, half asleep, counting quarks. Sleep has almost taken you and BAM! You suddenly, for no apparent reason, jerk violently. Your chances of falling asleep for the next several minutes have been reduced to zero and you curse your deity of choice. You have just been victimized by a hypnic jerk. A hypnic jerk (technically known as a myoclonus and also known as hypnagogic massive jerk, a moyclonic jerk, or a sleep start) is an involuntary muscle spasm – so you couldn’t even stop it if you tried – that jerks a person awake. These twitches from hell usually happen in the beginnings of sleep (one of the lightest stages). Don’t worry, this jerking, though highly irritating, is completely normal. 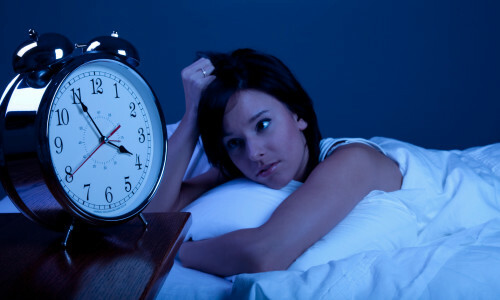 In fact, the American Academy of Sleep Medicine says that an upwards of 70% of people experience this. A myoclonus is most likely to happen if you aren’t comfortable and, ironically enough, if you are really tired. Nobody knows why these robbers of sleep occur. There are, as always, some hypothesis to explain them. It’s possible sleep starts are a result of the relaxing of muscles. Other theories suggest that, as the body drifts to sleep, the brain interprets various temperature and breathing changes as falling. 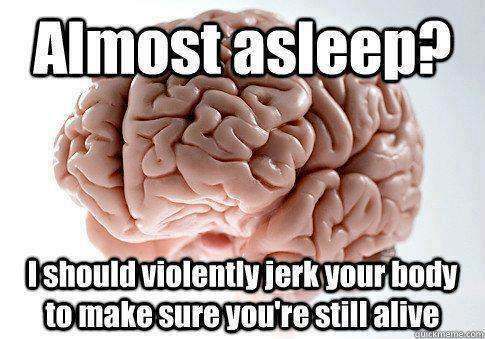 One of my personal favorites is the theory which says the body doesn’t know the difference between falling asleep and dying, so (as the picture says), your brain violently jerks your body to make sure you’re still alive and to keep everything functioning. I’ll also note that there are also auditory and visual myoclonic jerks. In the case of an auditory sleep start, people report hearing a loud snap or crack come from the center of their head. Likewise, in the visual side of the spectrum, people report seeing a blinding flash of light (this one is very rare). These spasms probably occur more frequently for people trying to stay away, people who are overtired, stressed, or those who have caffeine in their system. Alcohol may also contribute to the frequency of moyclonic jerks. How do you stop, or at least help prevent these things? The same way you cure every other sleeping ailment – relaxing bedroom, no caffeine, no strenuous activity, comfortable mattress, and white noise machines could also help. Personally, I do the good old fashion jerk where my body flails wildly as my brain confirms my vitality. What kind of moyclonic jerk do you experience? Are satellites experiencing the effects of global warming? You Are More than Stardust; You Are the Universe.